as bow and arrow, and 4) throwing weapon such as the dart. Then there were many special weapons used by different groups. usually is called da dao, big sword. The handle of a da dao can be 5 feet or more. used at the same time. Many groups also combine dan dao with other types of weapon, such as shield, whip etc. learn, and easier to use. There are many different types of dao. Depend on the length, width, and shape of the blade, the skills can be very different. in the article we will use the word "sword" when referring to it in this article. Traditionally Taiji Dao is dan dao. Some Taiji groups also have shuang dao skills. Here we will just talk about the more common dan dao skills. using the specially shape sword. skills, we need to talk about its shape. handle, and the ring pommel. associated with different types of skills. the upper edge makes the head of Taiji Dao look like a jian, Taiji Dao is also known as dan bei jian or single backed jian. referred to as one continuous section called daoren, or the edge of the sword. stiffness, similar to the effect produced by a steel I-beams used in modern construction. part of the sword. It can be used for hard blocks because the edge here is blunt, and it is also the part of the blade closest to the hand. also trap it by hooking onto it. Consequently, the number of hand guard skills for Taiji Dao is much greater than that of regular dao. The handle of a Taiji Dao is referred to as either daoba or daobing. At 10 to 12 inches long, it is longer than the handles of most other single swords. It can be wielded with both hands. Taiji Dao skills rely on this unique feature. These will be described in a later section. than 50 inches. This type of sword has a long history. into their own samurai swords. create their own special weapon. In the Taiji Quan group, this sword was further modified and developed. very mindful of the important differences that exist between those swords. Dao – the special shape of the sword. rather than relying primarily on power. necessary. So alternately use one or two hands holding sword is one of special Taiji Dao skills. 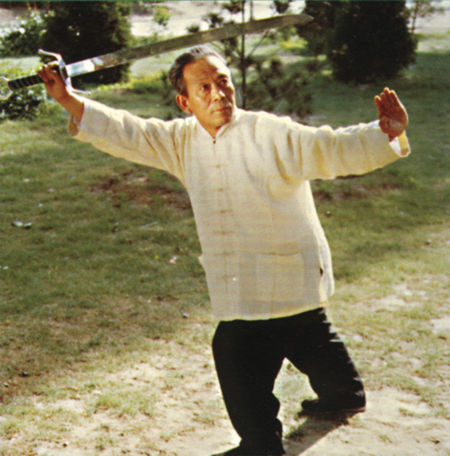 Although Taiji Dao has a two-handed handle, most of the time the rear hand does not even touch the handle. Instead, it holds on the ring pommel. How to use the ring pommel is very special and important skill in for Taiji Dao. who just use regular broadsword or saber to practice Taiji Dao skills. meaningful differences between Taiji Dao skills and other dao skills.